Vermont (population 626,000) is the second least populated state in the US behind Wyoming which explains slightly why the range of legal real money poker gambling options in VT is very small. Home to vast landscapes, majestic mountain ranges and exceedingly cold temperatures, Vermont is far better known for its top-rated ski resorts than its nightlife and real cash poker gambling presence. In fact, there are a total of zero commercial casinos, tribal casinos, lawful poker betting venues or racetracks located in the Green Mountain State. Even pari-mutuel betting, which is legal in all of Vermont’s neighbors, is a prohibited form of real money gambling. Given these facts, one would reason that online poker and legal Internet poker websites in VT stand very little chance of being regulated under Vermont law. But despite the wide and varied challenges it would face, the prospect of virtual Texas Hold’em poker websites and other real money Internet poker games coming to the state of VT are not quite as grim as they initially might seem, especially if nearby states New York and Massachusetts enter the fray with their own Internet poker gambling websites. And then there’s always the possibility of the federal government enacting an Internet poker bill that allows real cash online poker to be played anywhere in the US. Possibilities do exist. The Green Mountain State may get even greener when you make a cash wager on any of our real money US poker sites. Signing up for an account is easy. 2 Can Players from Vermont Play Online Poker? 3 Is Online Poker Legal in Vermont? The last attempt made by a governmental official in Vermont to build a commercial casino and real money poker room died almost as quickly as it was conceived . In early 2011, Ron Hubert, a second-term VT House Republican, introduced a gambling bill that would allow one casino to be built. The Vermont Lottery Commission would oversee the daily activities of the casino. The one casino and real money poker venue constraint was implemented to ensure that Vermont would not one day feature a Vegas or Atlantic City-like strip full of real cash gambling casinos. Can Players from Vermont Play Online Poker? There is little stopping residents of Vermont from flipping their computer on, creating an Internet poker account with one of a myriad of real money poker websites that accept US players, and seeing some Texas Hold’em poker flops. We have selected the best options for you on our online poker website’s real money page, where you can find out which poker websites accept poker gambling players from which states. Online poker legislation is a dead issue in Vermont. To date, legal real money Internet poker has not been seriously discussed in the Green Mountain State, nor will it likely be in the foreseeable future. However, government officials in VT have recently explored the possibility of selling lottery tickets online. Last year, the state legislature ordered the Vermont Lottery Commission to explain how an online real cash gambling lottery would work, and the potential impact it could have on sales and real money betting profits . So at least in theory, the state is open to the idea of online gambling, even if it’s not quite Internet poker yet. 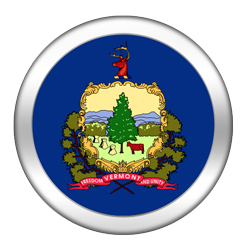 There are no chapters in Vermont’s gambling and poker betting statutes  that are specifically targeted towards online poker or Internet poker website gambling. In fact, no mention of them is made at all. As far as general gambling laws themselves are concerned, while we’re not an authoritative expert in the field of lawful real cash Internet poker in VT, we have exposed some interesting tidbits of information related to Vermont’s general stance on gambling and poker betting. If anything, going over Vermont’s gambling and real money poker betting laws will help you make a more informed decision as to what you can and cannot do when it comes to Internet poker gambling. The term gambling is not explicitly defined. Neither is the term bet and due to this notable exclusion, it is more difficult to get a clear picture of Vermont’s gambling and poker betting laws then it is compared to most states. Digging deeper, a vague definition of gambling can be combined by piecing together segments from a few different sections. For instance, it is revealed that anyone playing a game involving cards, dice, [and] tables [played] for money will receive a fine and/or prison time in VT.
Any coin or slot machine into which a piece of real money can be inserted and that may issue a piece of real money or any machine where the outcome is based upon an element of chance, whether the same be played for money, checks, credits, merchandise, or other thing representative of value is considered a gambling machine. According to Section 2135 it is illegal to own, rent or lease these machines in Vermont. The penalty for bookkeeping or pool selling carries a maximum fine of $250.00 and up to six months in a VT jail. Subsequent offenses carry larger fines and as much as five years behind bars. It probably comes as little surprise that Vermont’s gambling and legit real money poker history isn’t nearly as colorful as that of states like New Jersey, Nevada or even Florida. Like in other pre-Revolution colonies, gambling and real cash betting was prevalent throughout Vermont in the 1700s. This trend continued into the 19th and early 20th centuries. Betting on horseraces, playing cards in poker games like Texas Hold’em and engaging in other gambling activities, while not exactly promoted, was deemed fairly acceptable behavior. By the early 20th century, stricter laws and poker gambling and betting regulations were enforced. By the middle of the century, gambling in almost every form, including real money poker, was illegal. It wouldn’t be until 1978 that Vermont would re-establish its gambling presence. That year, it implemented a state regulated lottery. In 1985 VT joined up with New Hampshire and Maine to found the first US joint lottery real cash gambling game. To date it features five joint lottery ventures, tied for the most of any state in the US. And in 2012 the state began exploring ways to bring the lottery online. Of note, Vermont held out until 2003 to begin offering Powerball. Ironically, legit licensed horseracing betting is being considered in Vermont. However, no horseracing real cash gambling tracks are currently open for business. Besides Vermont’s various state lotteries, the only way to legally participate in real money gambling in games of chance is through non-profit and charitable organizations – in so long as the people involved are not required to wager valuable things on the outcome. As stated previously, there are absolutely no casinos, legal real cash poker venues, racinos or horseracing facilities located in the sparsely populated state of Vermont. However, the Abeniki Indian tribe is making a concerted effort to declare their presence within the state, and should that happen, they would likely attempt to open the state’s first casino and real money poker gambling room. Poker players in the Green Mountain State can access online poker sites, but it’s doubtful you’ll see legislation legalizing online gaming in Vermont. As of today, there have been no Internet poker bills linked to online poker brought before the VT state legislature. More concerned with the prospect of running an online lottery than virtual table games at real money poker websites, Vermont will likely not even entertain the idea of online poker websites until at least one of its neighbors takes action and launches into the lawful Internet poker market. On the flip side, online poker companies and Internet poker website operators are not actively pursuing an arrangement with Vermont for a couple of different reasons. For one, sans the presence of a suitable gambling and betting facility it will be nearly impossible for an online poker provider to set up a base of Internet poker operations. Secondly, Vermont’s population is so small, that it simply wouldn’t be worth it for them to pay an exorbitant licensing fee and ongoing operation costs to run legal real money Internet poker websites in VT; at least not unless Vermont forges an interstate Internet poker compact with a state like Delaware. Despite Vermont’s fledgling population and reputation as a state that discourages gambling and real cash poker betting, it featured one of the highest pre-Black Friday online poker websites participation rates in the US. From 2009 to 2010, it ranked eighth. Neighbors Maine and New Hampshire ranked sixth and first, respectively . Any state that is considering a legit online lottery at least stands a chance of considering state regulated online poker at legal real money Internet poker websites. Combined with its pre-Black Friday interest in sites like PokerStars and the prospect of legalized online poker gambling websites one day coming to Vermont, is at the very least alive. But in reality, there may be simply too many factors for the state of Vermont to overcome, namely its paltry population, lack of commercial and tribal casinos with real cash poker betting rooms and the general indifference of government officials. For now, the best hope for real money poker players in VT is to play either on poker websites that welcome US players, or hold off until a casino with a lawful real cash poker room is finally built within VT State’s borders, which we think it will. ↑ Online lottery in the cards for Vermonters? ↑ Highest Online Poker Participation Rate in the U.S.